ChessMaine: WCC Bonn Round 5: Anand Does it Again With Black! 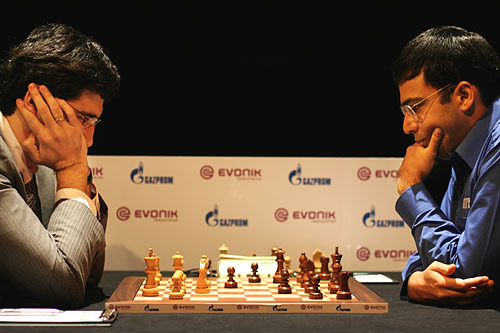 WCC Bonn Round 5: Anand Does it Again With Black! 10.20.08 GM Levon Aronian, the world's number seven ranked player mused during his analysis of round 5, "Did [Anand] summon the spirit of great Mikhail Tal to aid him? There is no other explanation than that there is something magical or surreal going on in Bonn." Two straight wins with black during a world championship match is a rare thing indeed. Anand now leads 3.5-1.5. Anand going into the same Queen's Gambit Declined Meran Variation as he did in game 3 with equally good results. 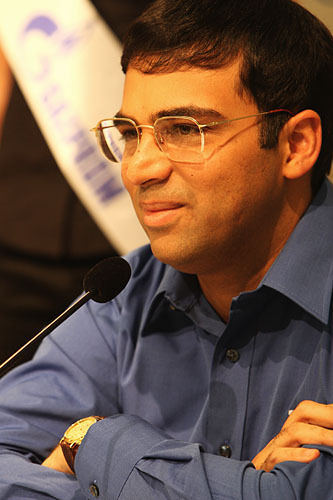 Viswanathan Anand looking satisfied and confident after round 5.